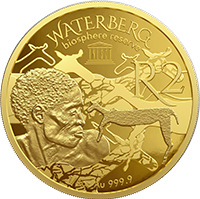 The very first Krugerrand was a 1oz gold coin. This classic size has been central to the Krugerrand collection for over 50 years. 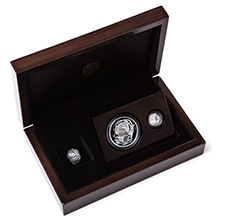 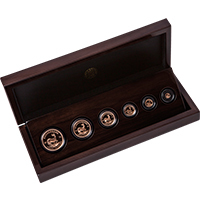 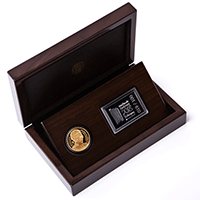 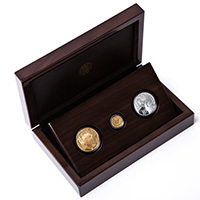 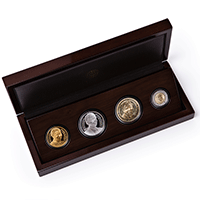 This 6 coin proof set contains a 2 oz coin, introduced for the first time in 2018, more than half a century after the striking of the first Krugerrand which embodies the history of the discovery of gold in South Africa and has become the symbol of South Africa’s proud numismatic heritage. Also contained is the 1 oz, ½ oz, ¼ oz , 1/10 oz, 1/20 oz and 1/50 oz. 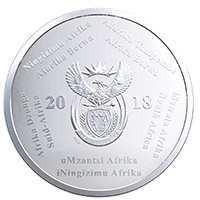 The 2018 crown-sized sterling-silver FIFA coin is an expression of all that symbolises soccer in South Africa; a fitting tribute to the 2018 tournament. 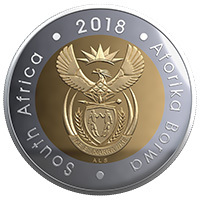 The South African Mint is one of a few mints globally, selected to produce coins commemorating the 2018 FIFA World Cup™. 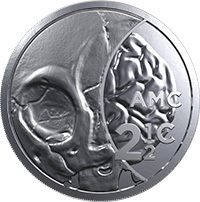 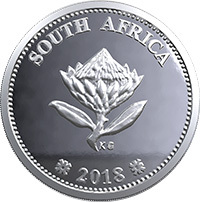 Following South Africa’s successful hosting of the 2010 FIFA World Cup, a silver R2 coin bearing South Africa’s most prominent football symbols: the vuvuzela, the national flag, the Zulu shield and soccer balls make up the design of the coin. 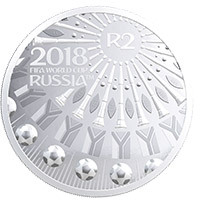 Packed in a beautiful black leatherette pouch, the 2018 FIFA coin is a must-have collector’s item. The design on the reverse of the coin is a celebratory splash of South African soccer symbols: the vuvuzela, national flag, Zulu shield and soccer ball. 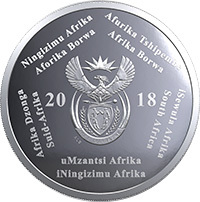 Depicted on the obverse of the coin is the South African Coat of Arms, the year 2018 as well as ‘South Africa’ in all the 11 official languages of South Africa. 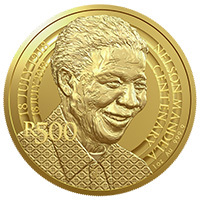 This special launch set is the final instalment in the Mandela Centenary coin range, offering collectors one more opportunity at owning the R500 1 oz, 24ct gold coin. A limited edition of 100 launch sets will be available, with each set representing one year of the centenary. 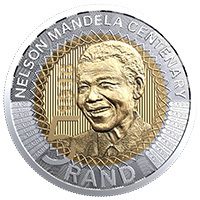 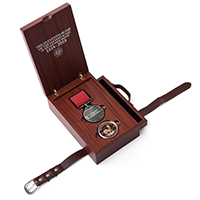 Each set consists of a R500 1 oz pure-gold coin featuring a “100” privy mark on the reverse, as well as a sterling-silver medallion. 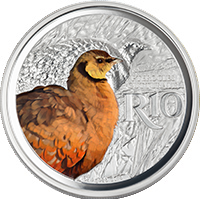 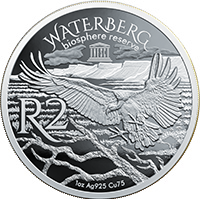 The 1oz R100 coin features the Coelophysids which were highly successful primitive theropod dinosaurs that lived worldwide from the late Triassic to early Jurassic. 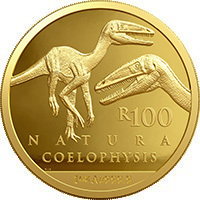 Coelophysis rhodesiensis, a small, agile dinosaur which preyed on small animals, inhabited South Africa and Zimbabwe during the early part of the Jurassic period. 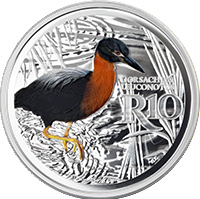 This slenderly built, bipedal dinosaur grew up to 3 m long and weighed about 32 kg. 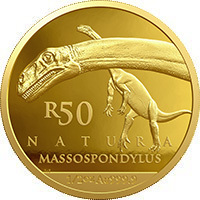 It had a typical saurischian type pelvis with a forward-jutting pubis. 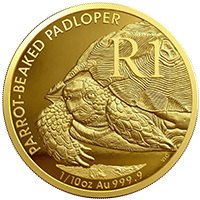 Its length was 4m to 6m and it had a small head, narrow body and long neck and tail. 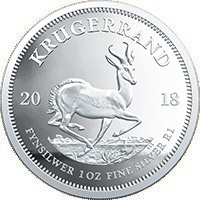 Its hind limbs were much longer and stronger than its front limbs which, together with the morphology of the hips, indicate that it was a bipedal. 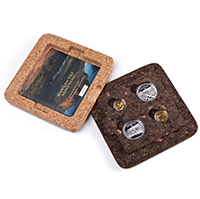 The small serrated leaf-shaped teeth suggest it was probably an omnivore. 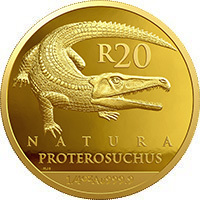 The Proterosuchidae, similar in form to the crocodile, is depicted on the R20 1/4oz gold coin.Proterosuchus ranged between 1.5 m to 2.2 m in length, and resembled the crocodile with their long jaw, short legs, thick neck and a long flattened tail. The elongated snout of this creature resembles that of a modern gharial, more than that of a crocodile or alligator which would suggest that it was a specialised fish-eater. 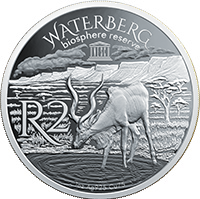 Its nostrils are on the side of the snout, supporting the hypothesis that they were terrestrial predators hunting in water. 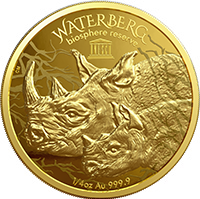 The prestige set is comprised of all five gold coins in the 2018 Natura range: the R100 1oz, R50 ½ oz, R20 ¼ oz, R10 1/10 oz and the R5 1/20 oz, each depicting a different Archosaur. 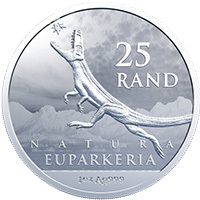 Euparkeria is an extinct species of Archosauria from the Middle Triassic of South Africa. 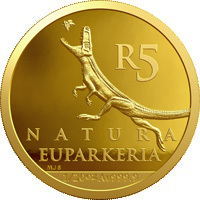 It was a small reptile that lived between 245 – 230 million years ago, which was related to the ancestors of the Archosauria, the group that includes dinosaurs, pterosaurs and modern birds and crocodilians. 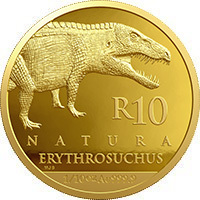 The obverse depicts the fossilised skull, neck and shoulder of an Erythrosuchus africanus. 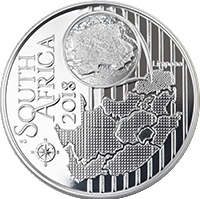 The words ‘Rise of the dinosaurs’, ‘Archosauria’ and the year 2019 as roman numerals ‘MMXIX’ complete the obverse design. 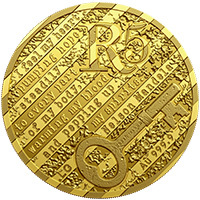 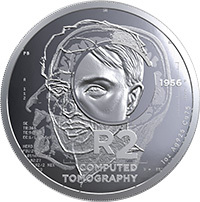 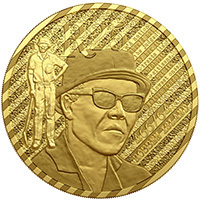 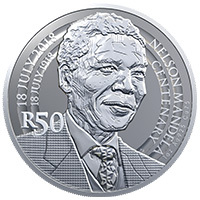 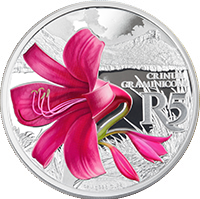 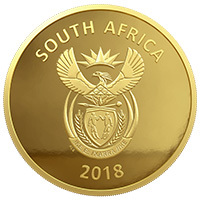 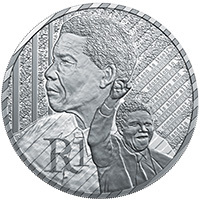 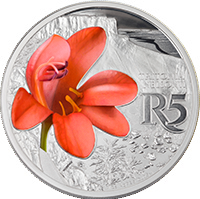 The R5 (1/10oz) 24ct gold coin comprises of the quotation: ‘I feel my heart pumping hope steadily to every part of my body, warming my blood and pepping up my spirits,’ taken from a personal letter that Nelson Mandela wrote to his wife, Winnie Mandela, in 1970, while she was incarcerated in Pretoria Central Prison. 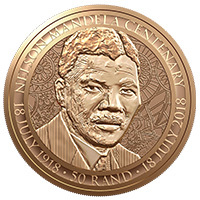 This 2018 prestige set consists of a 1oz 24ct gold coin and a 1/10oz 24ct gold coin, as well as a R1 sterling-silver coin, each featuring different developments in Nelson Mandela’s 27-year incarceration and eventual release.